There is an ongoing struggle within your body. One force is the free radicals and the other is antioxidants. In fractions of seconds, these opponents square off in the game of oxidation. Antioxidants are stable molecules that can donate an electron to a free radical without making themselves unstable. The free radical stabilizes and becomes less reactive. The loss of electrons is called oxidation. In your body, the free radical is an oxidizing agent, meaning it takes electrons from other places and in this case, it takes from antioxidants. Oxidation in the body is a normal and necessary process. Free radicals are highly reactive and unstable, oxygen-containing molecules with an uneven number of electrons. It’s the uneven number of electrons that allows them to easily react with other molecules, which can cause large chain chemical reactions in your body. Your body often produces free radicals in the process of breaking down nutrients to create energy. Free radicals have a lifespan of only a fraction of a second and when functioning properly, free radicals can help fight off pathogens. However, when there are more free radicals than can be kept in balance by antioxidants, the free radicals can start doing damage to fatty tissue, DNA and proteins. This imbalance is called oxidative stress. Keeping the balance can be difficult because free radicals in your body can also be produced by exposure to free radicals in the environment including ozone, certain pesticides and cleaners, cigarette smoke, radiation and pollution. SkinCeuticals to the rescue! 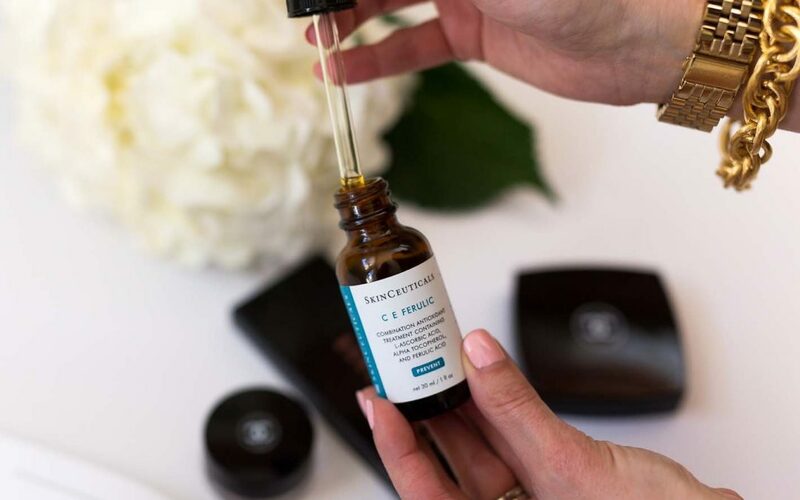 Perfect for any skin type, C E Ferulic® combines an antioxidant treatment containing L-ascorbic acid, alpha tocopherol, and ferulic acid to deliver advanced environmental protection against free radicals. This 24x Beauty Award Winner is a daytime vitamin C serum, improving the appearance of fine lines and wrinkles, loss of firmness, and brightens skin’s complexion. Once applied, it works overtime and remains effective for a minimum of 72 hours! Furthermore, there is a molecule produced by the liver that helps transport amino acids and plays an important part in purging the body of free radicals. Glutathione (GSH) is a peptide containing three important amino acids. Peptides are tiny proteins and active molecules that are created from the breakdown of collagen (protein made up of segments of amino acids.) Glutathione is made up of three amino acids: cysteine, glutamate and glycine. Virtually all your cells have glutathione, but this antioxidant is most highly concentrated in your liver, pancreas, spleen and eyes. Glutathione is primarily responsible for reducing the levels of cysteine on the surface of proteins and helps protect your body from free-radical damage, synthesizes and repairs DNA and helps recycle vitamins C and E. As you age, your glutathione levels naturally significantly lower. The GSH-poorly-balanced body can see significant benefits from an increased amount of these powerful antioxidants. Given intravenously, glutathione helps transport amino acids and plays a vital role in purging your body of toxic compounds such as heavy metals. By helping your body detoxify, glutathione helps reduce your risk of developing cancer by causing malignant cells to die but keeping healthy cells alive. Maintaining the positive benefits of free radicals while reducing the quantity (and quality) of their negative chemical reactions is a compelling weapon in a longer, higher-quality of life.